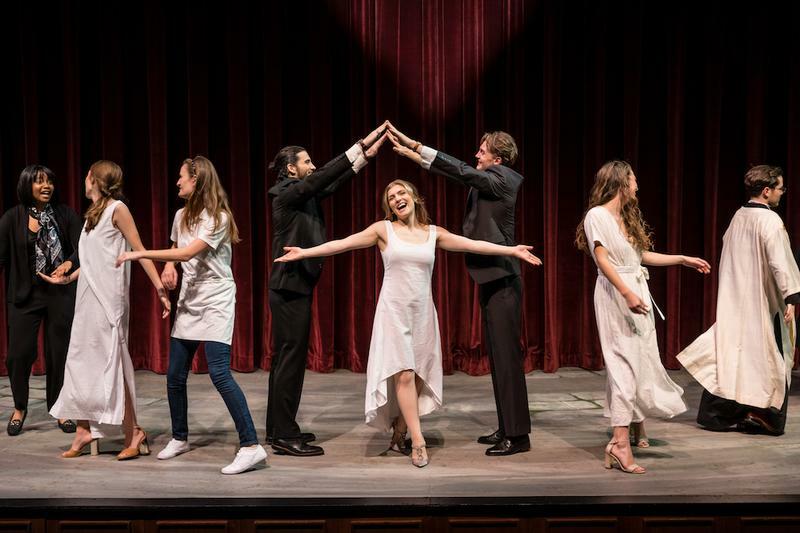 UBC Theatre’s Much Ado About Nothing oozes gaiety and merriment from start to finish. One of the play’s greatest strengths is how visually pleasing it is. Taking place in 2018 Venice, the show takes advantage of the modern setting by dressing their characters in high waisted pants, tasteful crop tops, soccer jerseys and power suits. During Hero’s wedding, the girls wear elegant jumpsuits and flowing dropped-back dresses that honestly had me envying their wardrobe. The show makes use of a surprise technical feature to beautifully depict both the inside and outside of Leonata and Antonia’s mansion. One side of the set is a gorgeous representation of a Venetian canal and the stage is awash in pastel blues. The other side shows the courtyard, warm and inviting with fairy-lights and cartoonish statues that transport the audience to summer nights on European patios. In the play, Claudio (Matthew Rhodes) and Benedict (Gray Clark) are returning from a victory on the soccer pitch. Sisters Leonata (Tebo Nzeku) and Antonia (Drew Carlson) host the team at their mansion for a month of partying. This festive atmosphere is conveyed through pop-y Italian tunes, spontaneous dance sessions and the occasional set of shots. The sheer amount of fun the actors seemed to be having helps keep the audience engaged, especially for those who may not have been following the quick jokes veiled in old English. Another way Much Ado modernized the play is to gender-bend the roles of Leonata and Antonia, who used to be two fathers instead of two mothers. This switch is surprisingly impactful, especially in the scene where Leonata rails against her daughter, Hero, for her alleged indecency. Nzeku beautifully portrays this shattered mother and the scene is a standout in the production. The villain of the show, Donna Johnna (Jodi Margit) is another gender-bent character. Margit plays her role with equal parts wickedness and hilarity. Dressed in an oversized white suit and caked in poorly blended foundation, Margit spends a large portion of the play smoking cigarettes and plotting in the shadows of the set. Her melodrama, which could be considered over the top, instead comes off as extremely funny — and little details, such as outfitting her with an ankle monitor, only add to the comedy. Despite the show’s best efforts, Hero (Sophia Paskalidis) still seems very much like a pawn being shuffled around the stage. Although it can be argued that she is very much enamoured with Claudio and eager to be his wife, the ensuring events show how little autonomy she truly has. This version of Much Ado did a good job of switching up some of the power dynamics and trying to portray Hero as the master of fate, especially by developing her relationship with her mother. But it just goes to show that no matter how much pop music is added to a production, sometimes Shakespeare’s words will still reflect the values of his time. Even with this small transgression, Much Ado is still a fun production and should be seen for the comedy, colours and modernized character dynamics. Much Do About Nothing will be playing at the Frederic Wood Theatre until November 24. Tickets are available at https://theatrefilm.ubc.ca. Student pricing is available at $11.50.